Update - 2017.11.16You simply turn a knob and start cooking in minutes. You simply turn a knob and start cooking in minutes. But, the performance of the grill can be really quite different, from one model to another, and the differences can naturally determine the quality of your food as well as the grilling process itself. The common problems people experience with gas grills are the slow heating surface, too cold and too hot surface at different places at the same time, baking space too small, smoking process taking too long or isn’t happening at all, rust, or many other. If you want to get the most out of your backyard cooking, what you need is a well designed, responsive, and durable grill. We have put together a buyer’s guide to help you in choosing your grill, and also 6 short reviews of good gas grills for under $300. When choosing the right gas grill for you, there are many different things to consider. There isn’t necessarily the right or the wrong grill configuration, but there are certain things that are better in every situation. We will now discuss those things and other differences between gas grills, enabling you to make an informed decision and find the grill that’s right for you. As you probably already know, there are two kinds of grilling: direct and indirect. With direct grilling, you put the food right over the fire and cook it quickly, like you would for burgers or stakes. For this you need strong heat, evenly spread across the grill’s surface. When selecting a grill, check the feedback from the previous buyers and also check online if there are videos for this particular grill you want, where the grill’s heating pattern has been checked. This checkup is usually performed with white bread test, where you place white bread slices all over the grill’s surface. If the heat is spread evenly across the entire surface, all of the slices will be baked to a nice golden crisp in the same time. If not, some will burn, while others will stay pale and soft. This is what’s called the indirect cooking or grilling. Here you need low and slow, steady heat over a long period of time in a closed grill. It is very important that you have burners that can bring that meat up to a 200° in a decent time frame, and keep it there. Very few grills can do this. Also, burner placement and airflow direction are crucial for this process. Most gas grills have vents at the back of the box, and because of that the heat travels up and then across the meat to the back of the box. If the burners are placed vertically, from front to back, all those places in between the burners will be much colder than those that are directly above them. A much better choice is a grill that has its burners placed horizontally, viewed from the cook’s position, from side to side. Here, the heat travels up and then across the surface of the entire grill to the vents at the back of the box, heating and smoking your meat evenly. These are the little tent-like pieces of metal that are placed over the burners but under the grill bars. They have numerous important roles, like spreading heat because they keep the heat from traveling directly up from the burners, and instead spread it quite a bit, giving you a more even heat spread. They also catch the drippings, keeping them from hitting the burners and also allowing the drip to vaporize and smoke your meat. So, a good grill should have as many of these as possible. There are some grills that also utilize ceramics for this, but they will cost more because of that, naturally. Also, if the cook box has too many vents at the back, it will result in heat and smoke loss, leaving your meat undercooked. The best way to go is to have a thick cast aluminum cook box, with ideally a single vent large enough (about a half inch wide across the entire back of the box) to keep the air flow going, but not too large to cause heat and smoke loss. So, considering these things, a good grill should have a thick box with a single vent, with numerous flavorizer bars over the burners for heat and smoke distribution, and those burners should be positioned side to side. Size is also important and while you may think that a small grill is good enough for your family, a larger grill will give you more versatility and allow for a simultaneous cooking, saving you time. Char-Broil Performance 475 gas grill has a sleek design, coming in black and silver color combination. The grill has ample space, cast iron grates that are porcelain coated, and everything rust resistant. The buyers can also choose different numbers of burners, and between the cart and the cabinet model. The porcelain-coated grease pan is removable for easy cleaning, of course. Does everything exceptionally. Cannot be beat. This grill goes where others can't - to heavenly crispy bacon perfection. Its stainless steel burners are positioned horizontally side to side, from the cook’s point of view, allowing for even heat and smoke distribution. They react quickly to the ignition switch, reaching high temperatures quickly. The grill also has a 10,000-BTU lidded side burner and a swing-away rack for additional space. With the rack and the primary cooking porcelain-coated cast iron grates, the 4-burner model has a total of 650 square inches of grilling space (the 475 of primary and the 175 of secondary space). This model also features large side shelves made of metal for increased working and prep surfaces, and it has a temperature gauge mounted on the lid for heat control. The grill retains heat nicely and performs admirably, allowing you to grill or smoke your food fast. Weber Spirit E210 is a budget friendly liquid propane gas grill with contemporary design and a high-performance quality. The grill has two stainless steel burners that both put out 26,500 BTU per hour, achieving very high temperatures with very low gas consumption rate. The cooking grates are made of cast-iron and are porcelain enameled, but more importantly, the flavorizer bars are also porcelain enameled, which means the heat will be distributed evenly and much more efficiently than in other grills with plain bars. The cooking area has a primary 360 square inch surface. 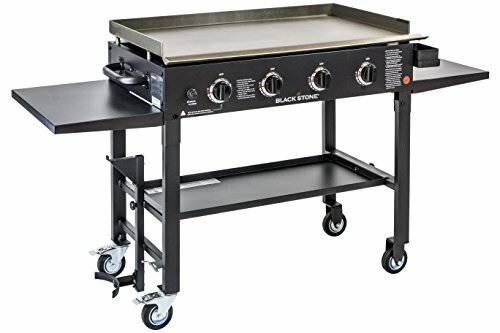 Together with the 90 square inch warming rack area this model has 450 square inches of grilling space, and of course the grill has stainless steel side-tables on both sides of the grill for prep space. The side-tables can be folded down for easier transportation or storage. The LP tank is stored in the bottom storage area which has enough space for additional grilling accessories, but maybe one of the best features of this model are its locking and swivel wheels, that allow easier moving and locking in to position. Char-Broil TRU Infrared Professional gas grill has some nice features and combines them with a contemporary, durable design. The grill comes in a combination or silver and black colors, like most standard grills do. The grill has 3 stainless steel burners, positioned vertically as viewed from the cook’s perspective (front to back), and a 13,000 BTU side burner. As space goes, this model has 420 square inches of primary cooking space and an additional 155 square inches warming rack. The grates are all porcelain-coated cast iron, while the airflow is designed in a way that there isn’t enough air for any flair ups, preventing flame from burning your food. Additionally, each burner is covered with a flavorizer bar, for even further heat and smoke distribution. This Dyna-Glo gas grill has some impressive features at first glance. It has a standard grill contemporary design, coming in two color combinations: silver and black, or bronze and black. The grill is easy enough to operate, with the ignition button placed right below the three burner temperature controllers. The cooking box is very large, despite the grill’s slim design. The primary grilling space together with the additional rack give you up to 503 square inches of grilling surface. Both grates are a heavy gauge porcelain enameled cast iron made, and the lid is made of stainless steel, which retains the heat nicely and is also high enough giving you space to put most foods you can think of inside. 3 stainless steel burners are positioned vertically, from the cook’s point of view (front to back), and they provide a total of 36,000 BTU’s. The grill has ample storage and prep space. The side shelves can be folded down for space saving. The burners are positioned front to back, vertically as viewed from the cook’s perspective. This means the heat and smoke will be strong in that line, but weaker and uneven in the grilling space between the burners. This Dyna-Glo DGE series gas grill looks incredibly professional and powerful at first glance, with some impressive features visible right away. The grill has a contemporary standard grill design, but with some differences from the other traditional home grills visible right away. It comes in three color combinations: silver and black, bronze and silver, and stainless color (shade of gray). The grill has 5 stainless steel tube burners, 10,000 BTU’s each, and an additional side burner that is 12,000 BTU’s strong. The 62,000 total BTU’s make for a very powerful grill. This model also has ample grilling space, with 703 total square inches of grilling surface. the side burner is designed to be good for pots or pans, for food you want to cook outside of the main cooking box. Its 5 burners all have a flavorizer bar each, and the burners are positioned front to back (vertically as viewed from the cook’s position). This Blackstone model is a bit different than the usual standard gas grills seen on the market, in various design and performance features. Firstly, the grill is designed with a flat top and no lid. So, the grill uses a 720 square inch flat surface rather than the usual grates. This model also features four independently controlled stainless steel burners, each giving off 15,000 BTU’s, with a 60,000 BTU’s in total. The unusual design does have its advantages, making this grill easy to transport or move. It is also very lighter than the standard models. It features side shelves for storage and prep space, and the area below the main grilling space is the same matching prep or storage space, giving this model incredible functionality. The LP tank is placed on the left hand side.